Austria’s past is not all palaces and polkas. The last 100 years, for example, saw the birth, death and rebirth of democracy and one of the darkest chapters in world history. The House of Austrian History is one of Vienna’s newest museums and takes a critical, balanced look at the country’s recent heritage and what it means to be Austrian. Opened in 2018, the House of Austrian History is still finding its feet. Conceived as a museum, web platform, discussion forum and more, it’s yet to settle into its final form. For now, the opening exhibition “Into the unknown – Austria since 1918” takes you on an intense journey through the last 100 years of the country’s history. The highs were very high. The lows unimaginably low. Democracy, Nazi terror, occupation, independence, equality, migration, and the meaning of nationality are just some of the themes tackled. (Told you it was intense). The modern displays, full of multimedia and interactive elements as well as personal stories from those involved in the events depicted, offer insights into the key moments of all that history. The museum celebrates the positive developments, but does not shy away from highlighting darker times. And for non-Austrians, the most interesting parts are, inevitably, those covering the immediate aftermath of WWI and the period of Nazi rule. What few of us realise is that within the space of about 24 hours at the end of 1918, Austria went from a powerful empire led by a centuries-old imperial dynasty to a defeated tiny democracy low on cash and self-esteem. Original footage from Vienna on the day after the war’s end brings home the sense of chaos and uncertainty. 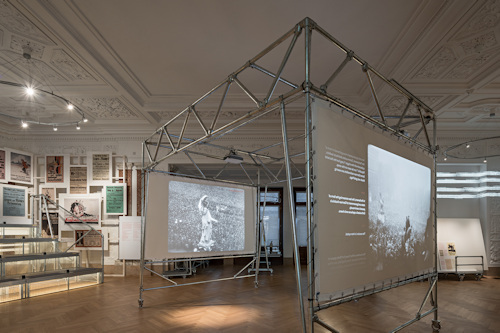 The exhibition gives the lie to the idea of the Austrians as the warmongering bad guys by documenting the strikes, peace movements, mutinies, and protests that characterised the latter part of the war in Vienna and elsewhere. Then there is the chaos and harsh reality of the aftermath, particularly the hardships brought by economic devastation. Beginning in 1918, the country undertook a radical transformation across all spheres of life – from politics to street names – as democracy replaced authoritarian rule. I actually cried at the displays on the growth of home-bred Austro-fascism in the 1930s and the impact of Anschluss with Nazi Germany in 1938. Tears at the utter insanity of that short period where reason and humanity seemed to desert so many people (but not all). Tears at the banality of form taken by such extremism. At a board game, where the winner was the first to evict six Jews from their businesses and bring them to a collection point. At the Nazi symbols in an exercise book belonging to a primary school pupil. At the initial political reluctance to accept Austrian complicity in Nazi terror. Tears at the stories of those who resisted and gave their lives as a result. At the time of writing, adults pay €8 for an entrance ticket and opening hours are 10 am to 6 pm each day (closed on Mondays), with late-night opening on Thursdays (until 9 pm). An entrance ticket also gets you into the Ephesos Museum, a small collection of Greek and Roman antiquities. 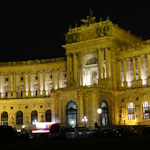 Both museums occupy part of the Neue Burg tract of the Hofburg Palace complex, so you might like to visit just to see inside this rather magnificent building. Vending machines offer drinks and snacks in a seated area just inside the museum proper. Lockers are downstairs at the entrance to the Neue Burg. The Neue Burg is quite central and a wing of the Hofburg palace complex that dominates the main tourist routes in Vienna’s old town. The entrance to the Ephesos Museum and House of Austrian History is at the centre of the building on the side facing Heldenplatz square. You can’t miss it, since it screams “Imperial entrance” at you, with its steps and ornate gates.